Figure Skating Blades. Kinzie's Closet has a great selection of Wilson Blades, MK Blades, Ultima Blades, Paramount Blades and Eclipse Blades. Figure skaters are only as good as their equipment and good figure skating blades can make all the difference in the world. Paramount blades like the Paramount 440SS and the Paramoung 420SS Gold Seal are lightweight and precision milled. 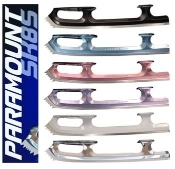 Paramount figure skating blades come in a variety of colors. Eclipse figure skating blades are the newest blades on the market. The Eclipse Aurora has the same profile as the Coronation Ace. Eclipse Figure Skating blades are high quality figure skating blades and are lighter, stronger and faster than the competition. The Ultima Figure Skating Blades are lightweight and made with stainless steel to help you jump heigher and keep your edges longer. Wilson figure skating blades are known as the worlds best blades. Choose from the Coronation Ace for intermediate skater, the Wilson Pattern 99 or Wilson Gold Seal for advanced skaters. MK Figure Skating Blades are the blades of choice for champions worldwide. From the MK Professional, the MK Phantom or the Mk Gold Star, Mk figure skating blades will provide you with the best quality blades. Paramount Figure Skating Blades has been a the choice of lightweight blades by many a figure skating champion. Paramount ice skating blades are made in the USA and are the most superior lightweight blade on the market. The Jackson Ultima Matrix Elite and Jackson Ultima Matrix Supreme figure skating blades are also lightweight blades. The less weight a skater has on their feet, the easier it is to get off the ground. Jackson Matrix figure skating blades, Paramount figure skating blades and Eclipse Titanium figure skating blades are all lightweight and are high quality figure skating blades. Wilson figure skating blades have been around for centuries as well as Mk figure skating blades. The Wilson Gold Seal and the Wilson Coronation Ace are the most popular blades in the world. The MK Dance is the dance blade of champions. Kinzie's Closet has a great selection of all of these figure skating blades to help you achieve your dreams.